Please call 800.801.8003 to schedule a viewing. Rare San Francisco gem with vertical development opportunity! 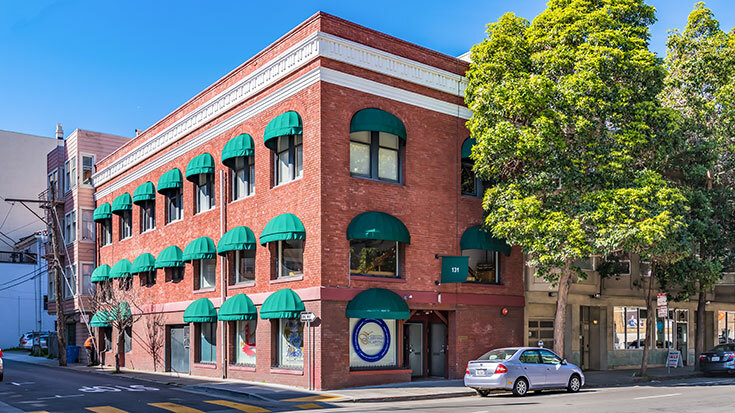 Desirable location near the Hayes Valley neighborhood and just steps from the SoMa District and “the Hub.” There is international appeal for this historic building and new owners have the opportunity to develop additional multifamily on top of 75% of the existing retail/office space. Preliminary planning with San Francisco city officials have indicated it would encourage the addition of residential units. Originally built to be the headquarters of a purveyor of fine pianos, the design of the building is as exquisite as the instruments it once held – even the building’s exterior features fanciful piano keyboard molding. Many upgrades contribute to the building’s current modern take – preserved brick walls and 16-foot ceilings on the third floor create a loft space perfect for corporate meetings or small venue for entertaining and get-togethers. HVAC upgrades were made to service each floor individually and there is a brand new sophisticated programmable security system with electronic locking and 1,200 lb locks. The system has motion, sound and camera detectors. The hardwood sub-floor on all 3 floors is original 1909 construction, with 4 inch thick mahogany, refinished in 2009. In addition to additional structural support, the building’s basement has been upgraded with a new server room, file room and vault. The property also offers an opportunity for high profile signage. 131 Franklin keeps good company: The immediate area contains tech firms such as Twitter, Zendesk, Dolby, One Kings Lane, Uber and WeWork. The property is well supported by MUNI and B.A.R.T with direct access to all parts of San Francisco, Oakland, Silicon Valley, the East Bay and all the airports in the area. Also within walking distance is the newly constructed SF Jazz Center, the world famous Davies Symphony Hall, SF Ballet, the War Memorial Opera House, Bill Graham Civic Auditorium and the Orpheum Theater. Across the street is the exclusive French American and Chinese American School and the San Francisco Conservatory of music. It’s a rare opportunity that a well situated commercial building with tremendous upside potential actually comes to auction. The seller has been an excellent steward to this property and desires to have a successful transaction at the time of the auction. The seller chose to auction the property to provide an open and transparent transaction that gives all parties equal opportunity to acquire the property. Please proceed with due diligence and with confidence. • Water/Energy Conservation Inspection. The Property is subject to the San Francisco energy and water conservation requirements. Energy and water conservation inspections will be ordered, and the results presented to the Buyer prior to closing. Buyer is purchasing the property as-is, where-is, and assumes responsibility for all costs of remediation, which may or may not include entering into a written agreement with the Seller confirming assumption of responsibility, submitting notice of escrow account (Form C) to the city, escrowing of funds equal to 1% of the purchase price, and any other requirements. Any and all required repairs must be complete and compliant within 180 days of transfer of title. Both Seller and Buyer agree to terms set forth in the ordinance. · Notice regarding gas and hazardous liquid transmission pipelines. This notice is being provided simply to inform you that information about the general location of gas and hazardous liquid transmission pipelines is available to the public via the National Pipeline Mapping System (NPMS) Internet Web site maintained by the United States Department of Transportation at http://www.npms.phmsa.dot.gov/. To seek further information about possible transmission pipelines near the property, you may contact your local gas utility or other pipeline operators in the area. Contact information for pipeline operators is searchable by ZIP Code and county on the NPMS Internet Web site.